1.Roast the following in a few drops of oil and grind to a paste: til, peanuts, dry coconut, dhania, jeera, methi and chopped onion. 2.Grind the following: ginger, garlic, chilli powder and haldi. Mix both the pastes and add salt to taste. Set aside. 3.Slit brinjals in four keeping the stem intact, put them in salted water. 4.Deep fry the brinjals in oil till they are half cooked and cool them. 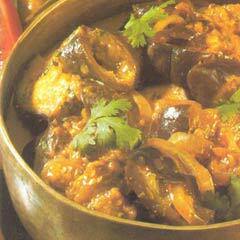 5.Stuff the brinjals with masala paste. Heat oil and add mustard seeds, broken red chillies, bay leaves and curry leaves. Fry a little before putting in the stuffed brinjals and tamarind water. Cook covered on slow heat till tender. I know a lot of people who stuff it with til तिल (sesame) seeds as well. Bagara baingan should have til only and not poppy! I really enjoyed your recipe even though I did my own twist on it but you definitely were a guidance for the spice selection. I have had this dish in Indian restaurants here in Australia and loved it. Also with sesame seeds. Anyway I just made it, (with half the chilli) and it was beautiful. still very spicy, but yummy! In Bagara Baingan traditionally only til is used and poppy seeds are used in the North Indian and Punjabi Curry disshes mostly.